3 Ways to build great customer relations in your Fashion Business. Are you building customer relations for your fashion business ? How much is important for you to build customer relations ? I think building a strong relationship with your customers and your dream customers, is the basic for your fashion biz. Before trying to sell anything, you need to create a relationship with your Customers and Dream Customers first and then sell to him or to her. Without showing who you really are and giving to them the best you can in value, you will not sell anything. Why someone can trust you if you don’t show who you really are? Learn from your Customers and Dream Customers: understand their problems, what they need and how you can help them. An easy way to do that, is to create a survey and send through emails or create a survey trough your Social Media. For example you can create a Survey on your Facebook page or on your Facebook Group. In this way you can come up with the right solution for them, and building a strong relationship with them. Emails should be able to provide valuable content for your customer and dream customer to share. When you provide content that addresses the need and provides a solution to your customer’s problem then you build rapport and the relationship that your fashion business needs to be successful. I know this can be difficult, but people often find it easier to really connect when they can put a face, a voice, and a personality to a name or a fashion business. Videos are the right strategy, because they can help you whether you’ve already met your customer or dream customer face to face or if you’re working at building relationships online, for your fashion business. What do you think fashionistas? 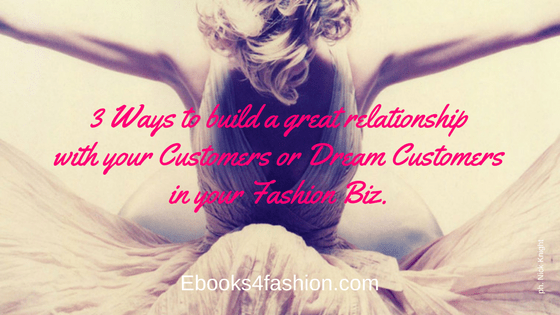 Are you building a strong relationship with your customers and dream customers in your fashion biz? If you think this article is helpful, please share with your friends and family or with whom can find helpful for their fashion biz. p.s. Stay tuned, because in the next days, I’ll be running an amazing GIVEAWAY that will be very helpful for your fashion business! So if you don’t want to miss it, join my VIP Facebook Group here. ← An interview with me and Candace Kinlaw where we talk about fashion business, struggles, failures and of course success.. Thank u so much for your comment!